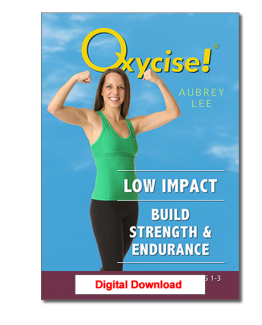 Full Body Workout Special – Digital Download – Oxycise! Take advantage of this awesome deal and receive 4 advanced full body workouts at SUPER SAVINGS! “I have been doing Oxy! for 2 1/2 years – most of the time, being consistent. Now I am ‘reaping the benefits.’ Even though I am at a difficult time in my life with menopause, I am determined that I can control my weight, toning and stomach!! I am 58 years old but I am proud to say that I am down one size. I have lost some weight, but more importantly, I have lost inches – especially hips and waist. Health-wise, I realize the importance of weight loss around the middle section. It felt so good to receive a compliment from my husband last week while I was combing my hair. He said ‘You really look good – I can see a big difference! !’ WOW!! — He made my day. I would recommend not to get disappointed with the weight scales – keep measuring weekly and pay attention to your measurements. You build muscle with Oxy! and remember, muscle weighs more than fat!! Also, alternating videos takes the boredom out of it. I alternate 3 videos: Level 3 and 4 and also Abs and Upper Body. For my age, my muscle-tone is great.